https://matcha-jp.com/en/greatertokyo/5009 Narita Layover? Go On A Transit Tour To Heartwarming Ibaraki! If you have to wait a few hours between your flights at Narita Airport, how about embarking on a tour to Ibaraki? Impressive shrines and temples that are rich in history and culture, as well as heartwarming encounters await! Many people fly into Narita every day, make their way to Tokyo, and never realize they missed out on a precious slice of Japan. Whether you’re flying into Japan, flying out, or have a day layover, why not use the “transit” time to experience a rare and heartwarming side of Japan? A day trip out from Narita to Ibaraki Prefecture would give you the chance to experience the beauty of Japan. In one day and with less than 7000 yen, we can visit multiple places of cultural significance, and even stop by a hand-baked rice cracker shop, one of the only three of its kind left in all of Japan, on the way. From Narita Airport, head to the B1 floor to the train station. We’re going to The Kashima Jingu Grand Shrine, which is dedicated to one of the Shinto patron deities of martial arts. Although we will change trains twice, we will not exit the station gate until our destination, so tell the staff at the red JR ticket window and they will give you a single ticket for about 970 yen. It may seem like a long way, but it is an easy ride. The break at Narita Station can be used to buy a drink from a vending machine, use the restroom, and to look for the next train platform without rush. Also, Narita Station actually has an older feel that makes it fascinating to look around. Just remember to stay within the ticket gate, as we won't exit until the destination. The Kashima Jingu Grand Shrine is a key shrine in Ibaraki, and sees the second largest amount of visitors in the prefecture on New Year's Day. Dedicated to the deity Takemikazuchi-no-Okami, one of the patron deities of martial arts, it has maintained a strong connection to martial arts over the years. To get to this shrine, exit Kashima Jingu Station and head up the red brick road. There is a tourist office outside the station, to the right, if you'd like to check directions or get a pamphlet. Once at the traffic light at the end of the road, turn left and you should be able to see the shrine's entrance gate, one of the largest three shrine gates in all of Japan. The walk there takes about 8 minutes. Before the Meiji Restoration (1868), The Kashima Jingu Grand Shrine was one of three main shrines given Imperial status, and today its main shrine (honden), prayer hall (haiden) and tower gate entrance (rōmon) are considered Important Cultural Properties of Japan. On top of this, the shrine also houses the sword Futsu-no-Mitama, a National Treasure of Japan, in its treasure house. Entering the shrine grounds, you may be struck, as I was, by the immense height of the forest and structures. While the grounds are easy to cover in a short time, the shrine has an awe-inspiring atmosphere. Take some time and explore according to your schedule, but remember to check the departure time of your train to the next stop. If you have time, you can enjoy a traditional Japanese meal near its "Mitarashi", a gate submerged in a lovely carp fish pond. The restaurant, Hitoyasumi, is known for its soba noodle dishes. Its seasonal "Noryo" soba lunch menu, a summer dish consisting of refreshing soba noodles served with dipping sauce and a side dish made of eggplant, comes highly recommended (1200 yen). On a beautiful day, you can also enjoy shaved ice or other treats outside under the shade of the trees on the restaurant benches. On your way back to the station, keep your eyes out for deer. Similar to Nara, these messengers of the gods also live on the shrine grounds. Get on either the 13:23 or 15:00 train back the way we came, toward Sawara, a few stations. We're getting off at Itako this time. Access 8 minute walk from the station, up the brink road from the station and left at the traffic light. Choshoji Temple cannot be missed. Built in 1185, this temple is a historical wonder. It is commonly thought to have been constructed by Minamoto-no-Yoritomo, the founder and the first shogun of the Kamakura Shogunate of Japan (established in 1185). In June in Itako, there is a famed Ayame Matsuri, an iris festival, as the irises bloom beautifully along the Maekawa River. 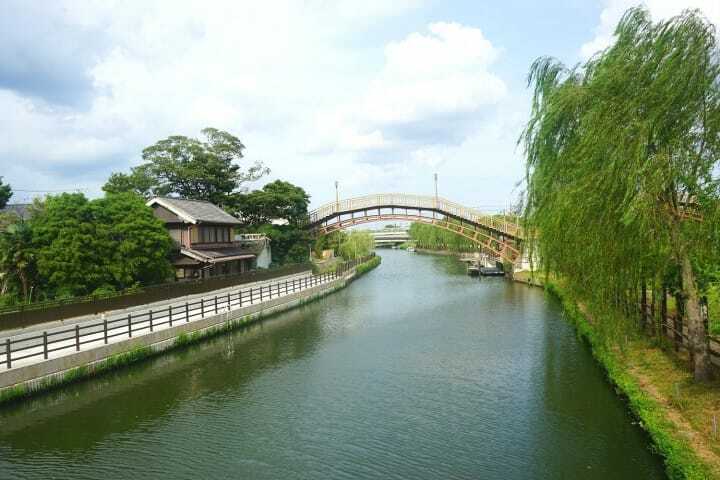 Near this river, you'll find the path to Choshoji Temple. It's a long, straight path, building anticipation and an introspective mood. Just follow the signs; it's about a 10-minute walk. Once you arrive at the temple grounds, struck by the weight of history before you, be sure to look for the bronze bell which has been declared an Important Cultural Property. With an appointment, you can enter the inner temple building and have some tea in a room that once held a very important guest. Mito Mitsukuni, a prominent member of the Tokugawa family, contributed greatly to the temple's restoration in the early Edo era (1603 - 1868). It is said that he visited this room several times. The best time to visit this temple is in June when the flowers bloom and the view is lovely. Or in spring when the air is fresh and you can see the cherry blossoms. Whether you know your history or not, this temple immediately impresses. The weight of philosophical musings will be sure to follow you out back into the world. So... how about a snack? Now, this is the place. To be honest, this senbei (rice cracker) shop is worth the entire trip. This shop, established in 1969, is a key part of its local neighborhood. All the senbei are made entirely by hand, and from the rice to the soy sauce, and to the charcoal used to roast the crackers, all ingredients are produced and gathered locally. This is also one of the last shops of its kind, which still makes senbei (rice crackers) the traditional way by charcoal. There is nothing quite like freshly cooked, crispy and warm senbei. It's easy to taste the care put into each cracker. You can even enjoy making senbei yourself by calling ahead to request a hands-on experience. The family that owns the store are so welcoming, and will pull you up a seat right next to the stove to show you how its done. During my visit, I was given a wonderful welcome, and, while enjoying an icy refreshment, tried my hand at flipping my own crackers. As soon as they browned, they were coated with soy sauce and handed over warm and savory. This lovely family not only makes tasty, fresh senbei, but will make sure you get the tastiest, freshest of what they have to offer. Once you've gathered as many souvenir senbei as you can carry, head back to Itako Station. From here, we'll get a taxi to Itako Bus Terminal. This will take about 10 minutes, and cost 1900 yen. Getting in the taxi at least 20 minutes before the limousine bus is scheduled is highly recommended. Now, depending on the schedule you’ve kept, you can either get on the 16:37 bus back to Narita, or on the 17:57 bus. Be sure to be at the stop in time to board. It costs 1050 yen and will take between 30-40 minutes. If you have a night flight to catch, please try to be on the earlier bus to be safe. If you are flying out or in transit, your time in Narita (or even in Japan) may be short. That does not mean it has to be wasted. This day trip out of Narita Airport takes you to Ibaraki, the heart of Eastern Japan's history and culture. Beautiful nature, local traditional foods - it may be just a taste of Japan, but it's a filling one. So, if you have the time to spare, why not hop on a train, look around, and see what heartwarming Ibaraki has to offer? To get back: Itako Station → Itako Bus Terminal - by taxi: 1900 yen; Itako Bus Terminal → Narita Airport by bus: 1050 yen. Lunch, souvenirs, and other expenses: around 2500 yen.